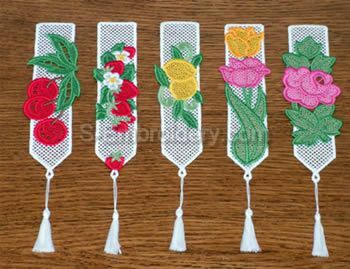 A set of 5 free standing lace bookmarks with fruit or flower decorations. Note:Images are available further down this page. I love these. They will make ideal christmas presents for friends. How about some for the men? I made these for &quot;Secretaries Day&quot; and they were a big hit. I would suggest you match the top and bobbin thread on dark colors like the cherries and the roses if you use red. The design is very delicate and open and if you use a light colored bobbin it may show through the edges of the design. I could not find small tassles and instead of making my own I used 1/8 inch ribbon looped through the eye and they looked nice.